Yes, I know. 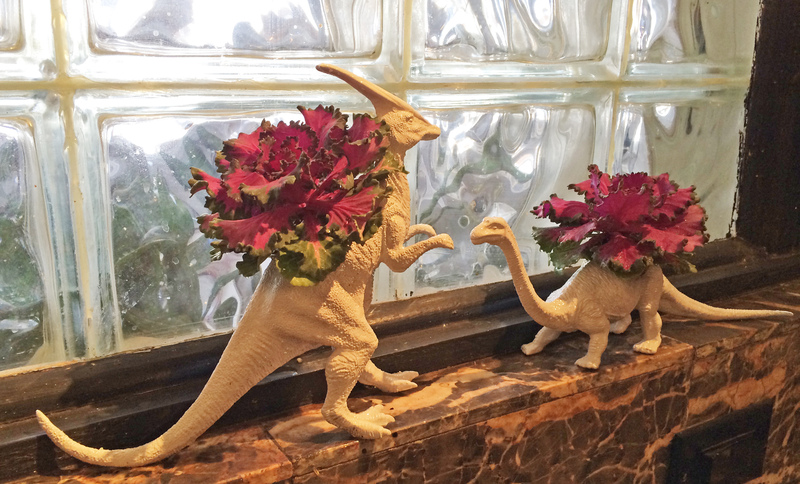 You’ve seen these Dinosaur planters all over the internet. Ho hum. Well I don’t care, I made a couple, and I’m going to show you how whether you like it or not. 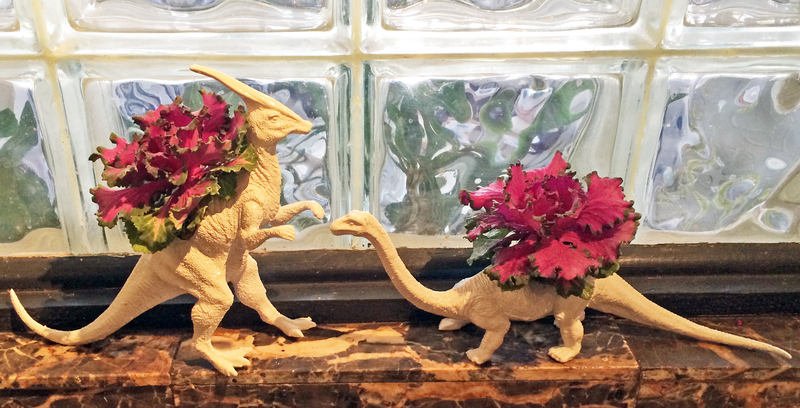 I bought a bag of assorted dinosaurs at the thrift store for a couple bucks, determined to do something fun with them. 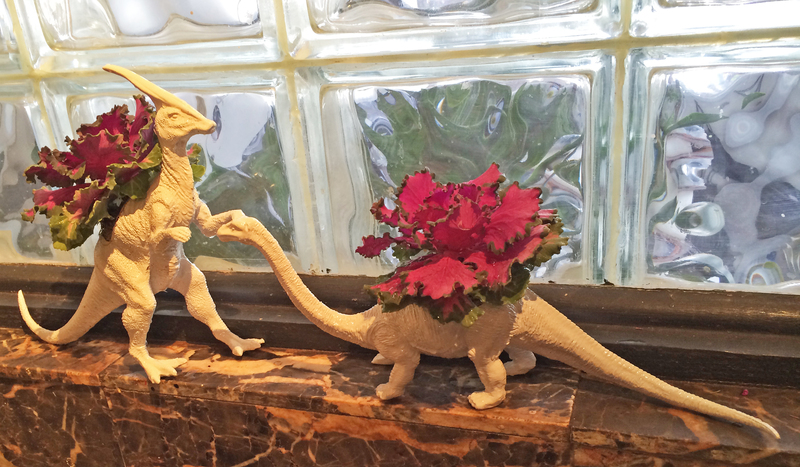 I decided to turn the bigger ones into little planters. You can put pretty much any small plant in there, I know Tillandsia (air plants) have been a popular choice, as have small succulents, but I wanted to do something different. 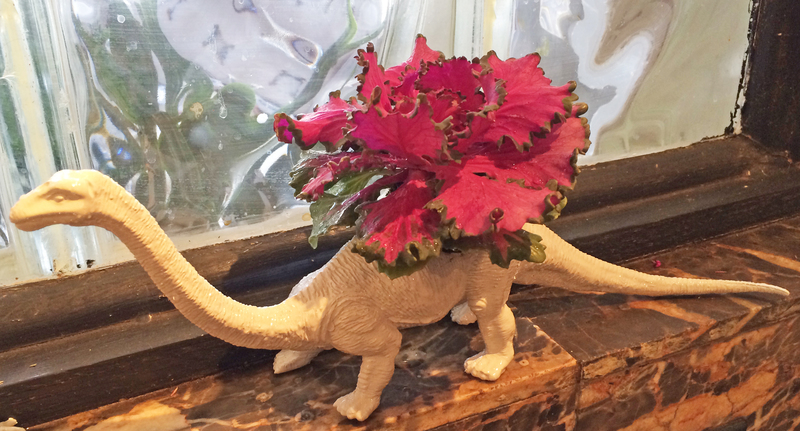 I found these tiny 1″ ornamental kale plants at the floral wholesaler and thought they’d be perfect (you should be able to find tiny plants at pretty much any nursery. I’ve also seen them at Home Depot.) I’ll probably have to transplant them if they get too much bigger, but for now they are a nice punch of color for our dreary Denver Winter. 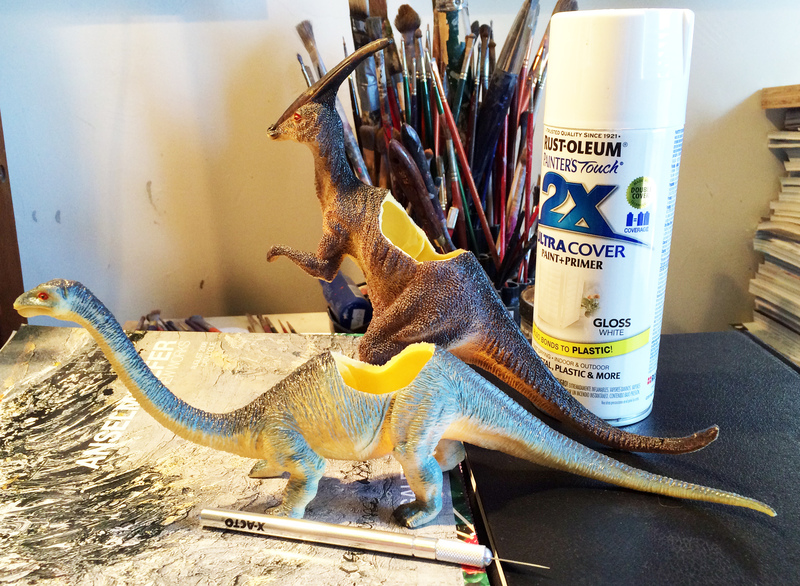 I started with the rubbery Dinos, and cut out appropriate size holes with a sharp Xacto blade (If you have the really hard plastic Dinos, you will need to use real tools, like a drill & jigsaw.) 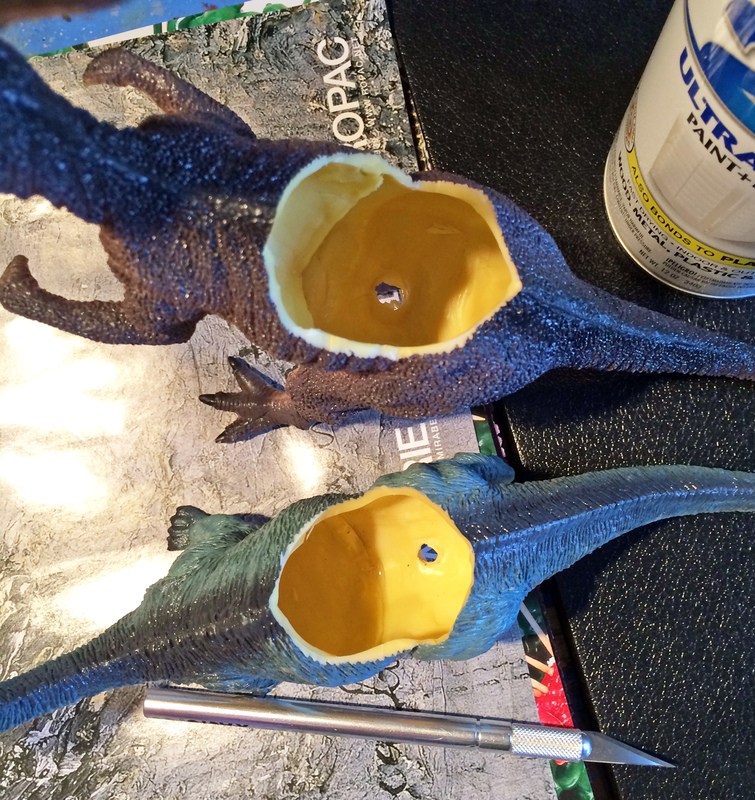 I also popped out the squeaky bit on their undersides, which makes a perfect drainage hole. I let them dry overnight before planting. 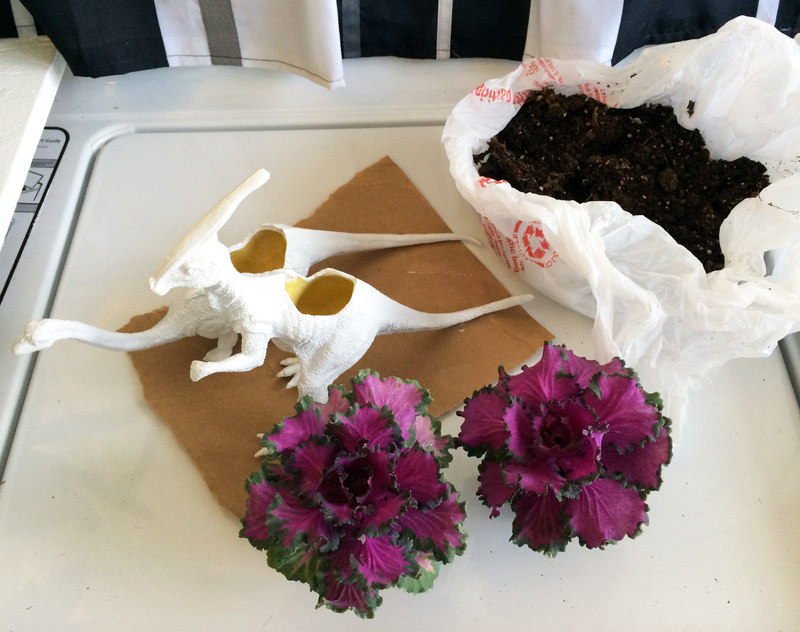 I filled in the deeper bits with some soil before squishing my little plants into the holes. After planting I gave them a good soak, and here they are gracing the kitchen window sill. Note: If were doing this again I would have given them 1-2 more coats of paint. That being said, I like them just fine as is. I little fun color for a Winter’s day that makes me smile, and it only cost me about $6. 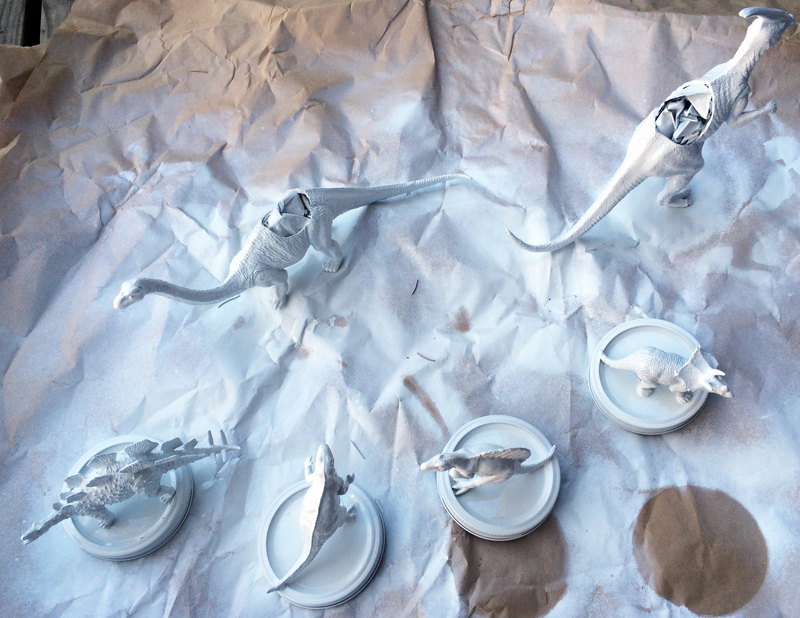 Stay tuned for another Toy Dino Project later this week! 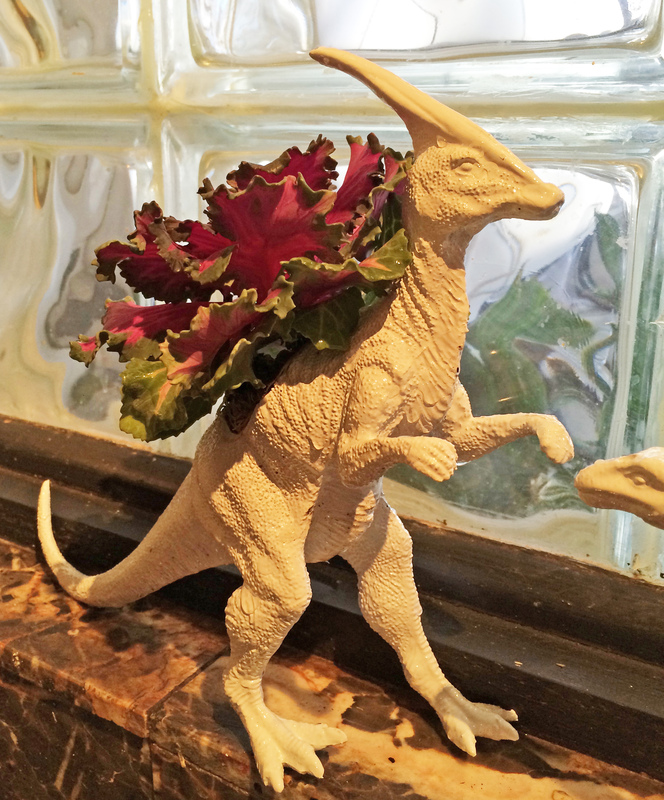 This entry was posted in decorating, DIY, home, plant care, Thrift store shopping and tagged decor, decorating, dino, dinosaur, dinosaur planter, DIY, ornamental kale, painted dinosaur, painted toy dinosaur, toy dinosaur, toy dinosaur plater, uses for toy dinosaur. Bookmark the permalink.